I started carving the neck by cutting the width down to size. Unfortunately I didn’t have access to a band saw so I did it all with a hand saw and as you can see I didn’t cut very straight. But as long as I stayed on the right side of the line it was nothing a hand planer couldn’t fix. Here again you can see my super straight cutting skills (or maybe not cause this picture is kind of blurry). 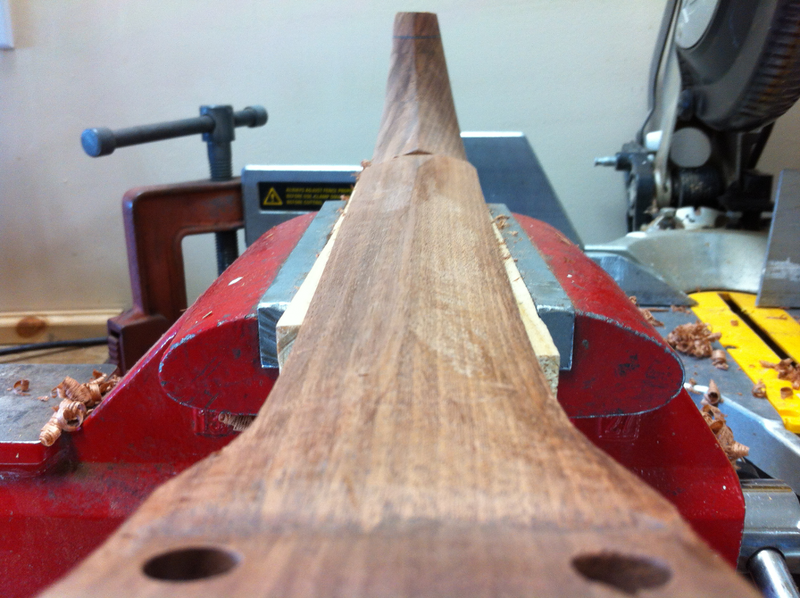 The picture below shows the neck planed down to the correct width. 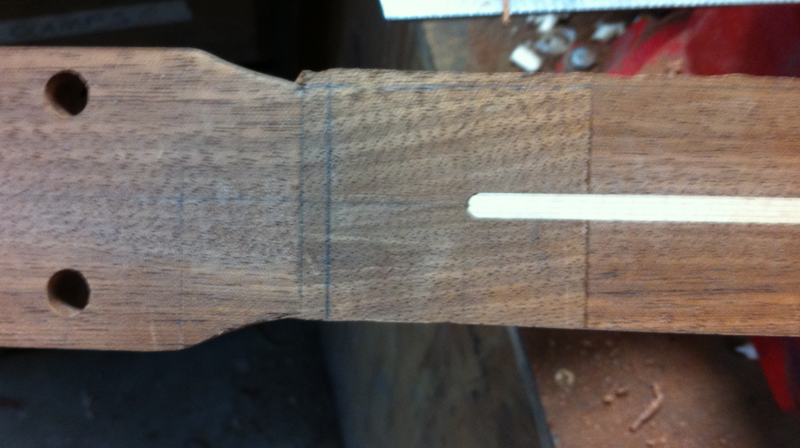 I had to cut out a channel in the sound board for the truss rod to fit into as shown below. 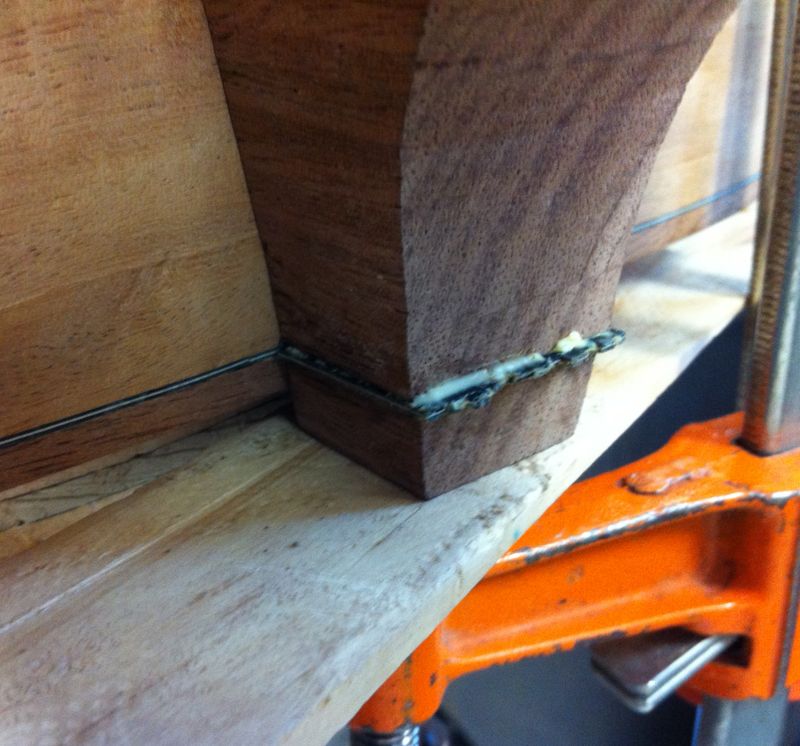 I used a hand drill to make a hole through the soundboard brace for the truss rod nut to fit through. It took me a while to get everything to line up to where it would fit. 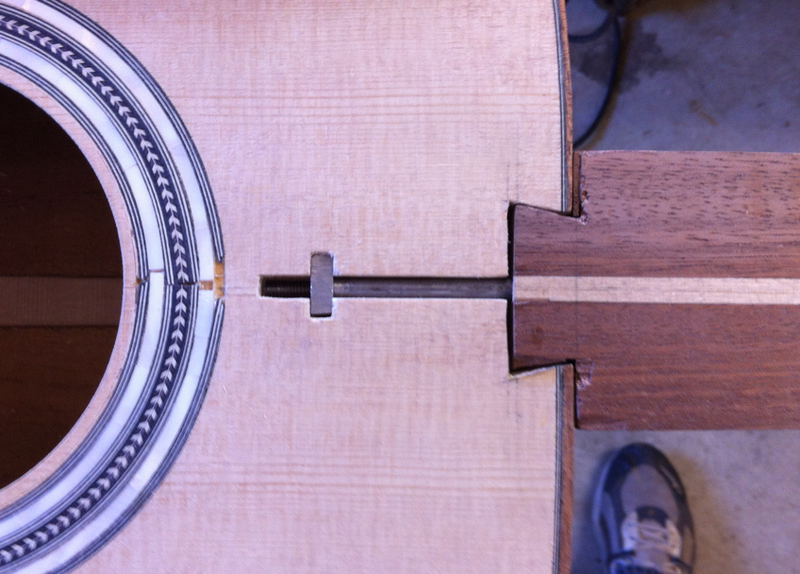 In order to get the neck to sit parallel with the center line of the guitar body I ended up having to put a spacer on one side of the dove tail joint as you can see below. 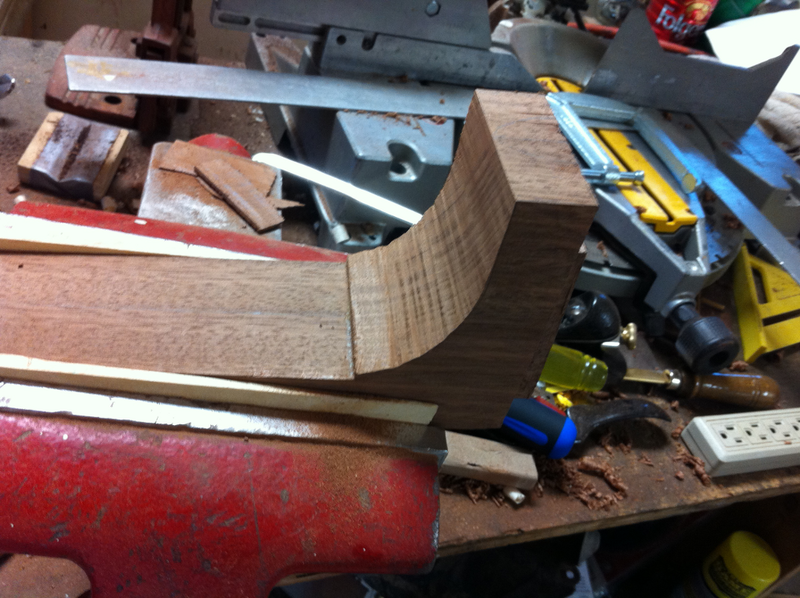 After I planed the neck down to the correct width I began working on shaping the heel. I started that by cutting out the main heel contour as shown below. I used a coping saw to make the cut. Next I used a hand planer to thin down the heel to a more pointy shape and then cut the bottom of the heel off right at the intersection of the black and white laminate, because I wanted to extend the laminate into the heel. 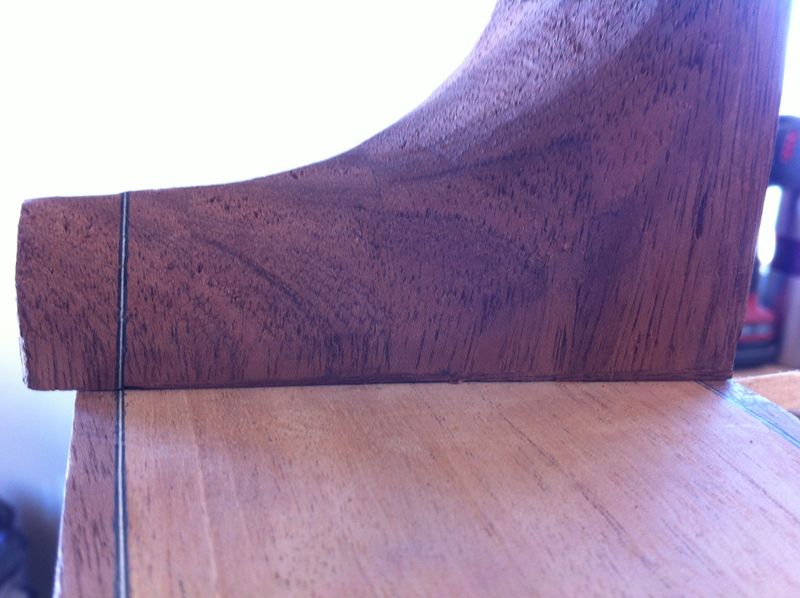 I glued in the strips of laminate next so that I could proceed with carving the heel as shown below. I just glued a bunch of strips of the black/white/black laminate rather than using a single piece of black/white/black laminate. 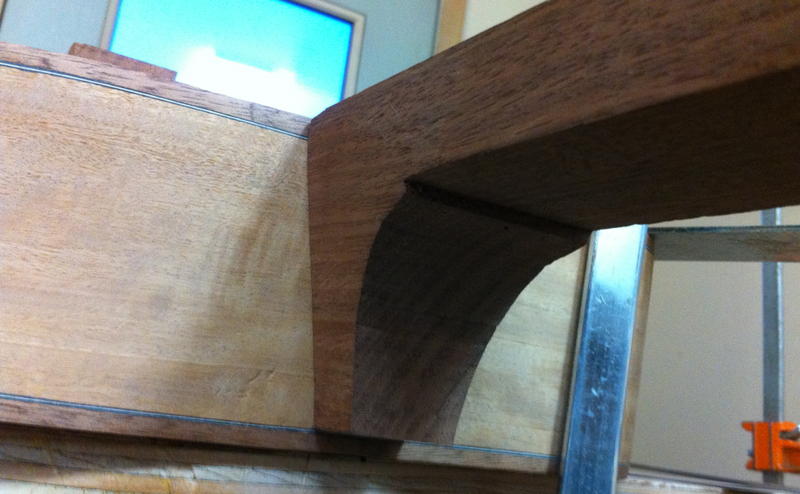 I also made sure that the laminate heel insert was parallel to the plane of the back plate at the top of the guitar. Once the glue had dried I continued with carving the heel. From here on out I switched over from a hand planer to a 1 1/4″ chisel. I drew a center line down the heel to help guide me while I was shaping the heel. I was pleasantly surprised with how well the chisel worked. 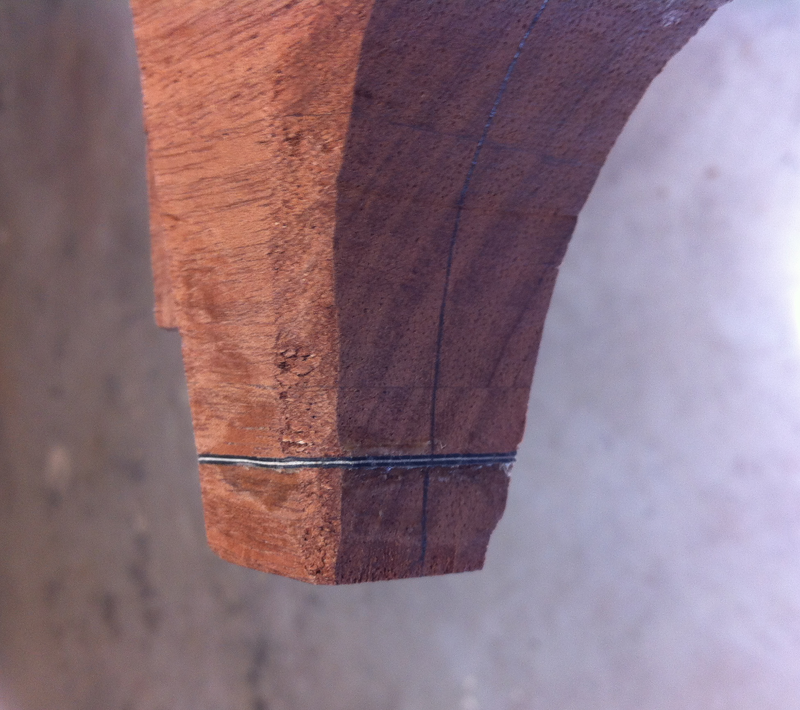 I found this part of carving the neck to be especially satisfying. 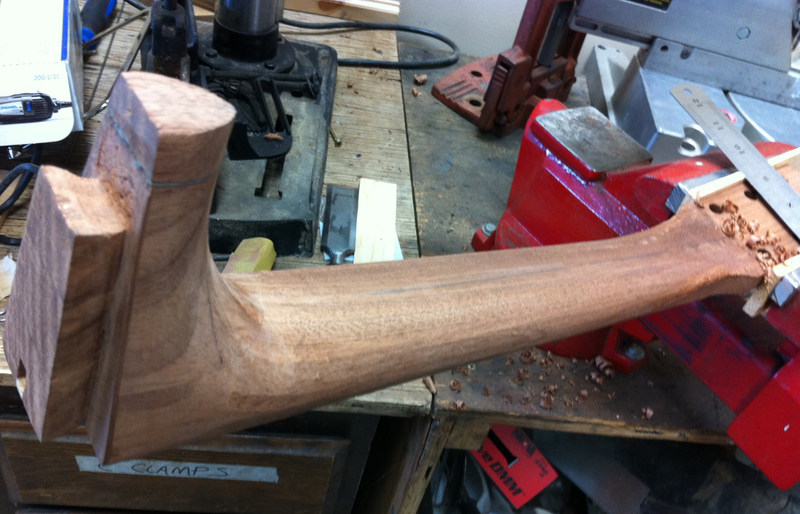 For the most part I would start at the heel cap with the chisel and work down to the neck. I found that holding the chisel tip at a slight angle and pushing down and sideways so that the chisel blade worked with both wedge and knife action worked really well. A side view of the heel with the laminate insert. 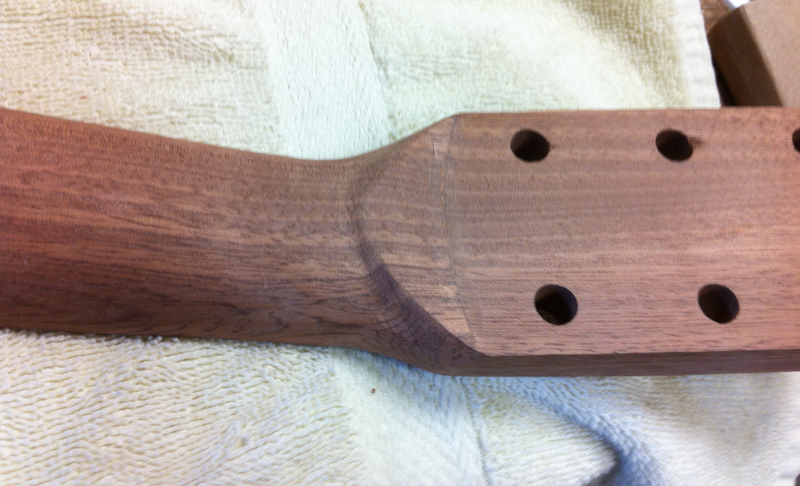 I planed off the heel cap flush to the body later on, after I’d glued on the neck. 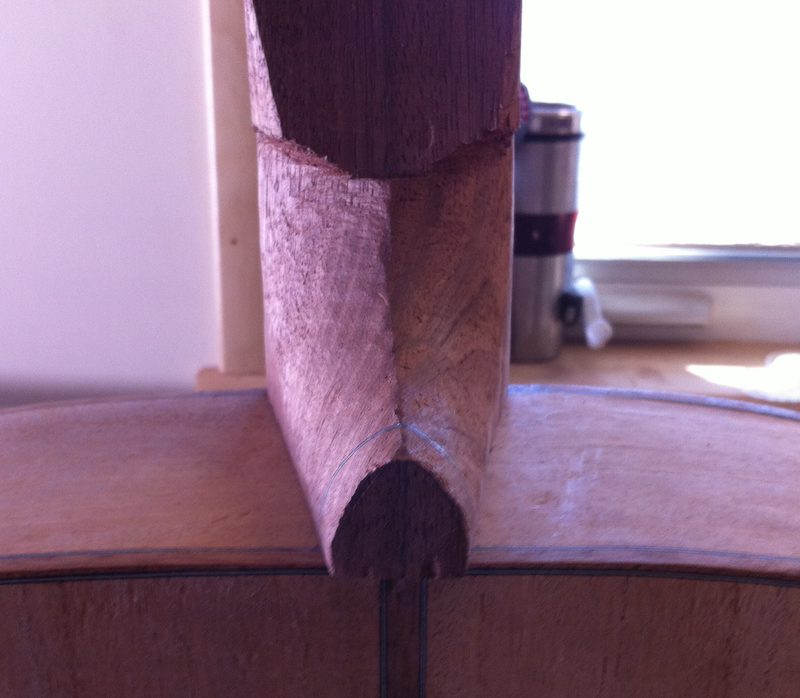 I continued on with carving the rest of the neck using a spoke shave . 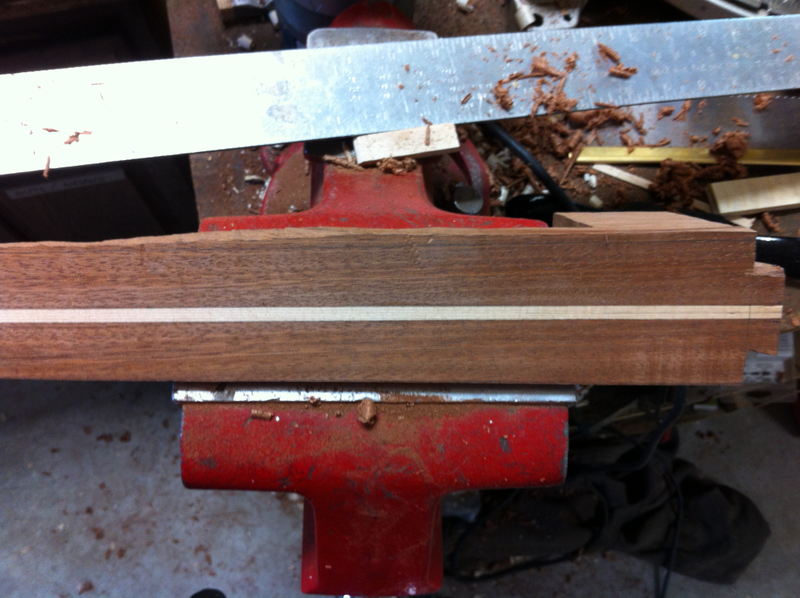 My goal was to thin the neck thickness down to about 11/16″, but no less than that since I had made the truss rod slot a 1/2″ deep. Here the core of carving was essentially complete with just the transition between the neck and the head stock left to go. At this point I moved on to making the fret board. 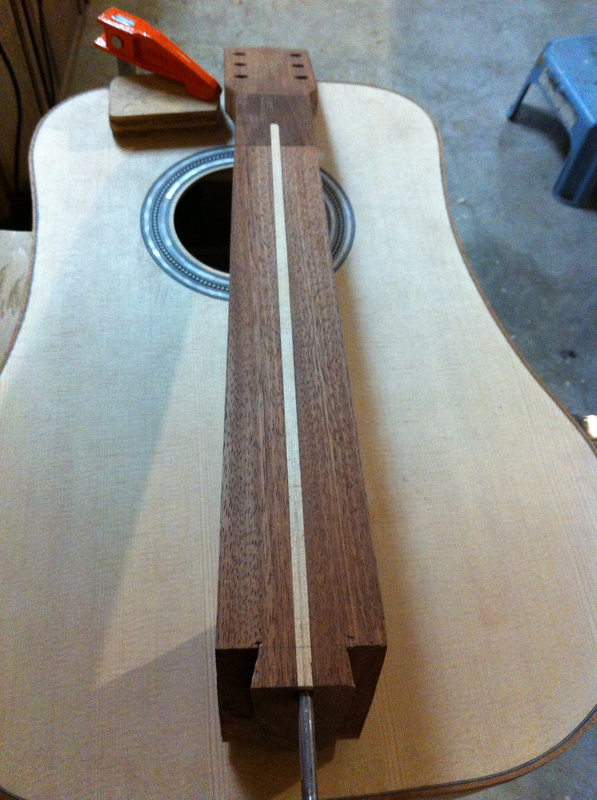 Before I glued the neck on I wanted to make sure the fret board would sit properly. Good job. Beautiful tone and sound sustain. Thanks! For my next guitar I’d like to try and experiment with the bass some more I think. Did you consider a bolt on neck? Adding a pickup to make it Acc/Elec. I am thinking of starting a project but have lots of reading to do first. I build cedar strip canoes and kayaks and thought it would be cool to make the face(not the back sound board) from strips of cedar. I don’t think it will deaden the sound too much. I considered it, but I was for some reason attracted to a dovetail joint and I pretty much decided on that early on. I work with a guy who is nearly finished with his first cedar strip canoe, it seems like a lot of fun. I’m not sure how cedar would work as far as sound quality goes, I picture in my head that it would be nice and light, but I honestly couldn’t say. Nice job by the way! !